Greece is a beautiful country in Southern Europe that is known to change the history of the world. The birthplace of philosophy, the Socratic Method, democracy, the Olympics, and much more, Greece brings millions of tourists each year. It may have had some issues in recent years, but as far as tourism is concerned, Greece does not fail to impress. The mainland has high mountains with gorgeous scenery, while the beaches look like they are taken out of a magazine. People in Greece know how to party, and their food is exceptional. Not to mention that the Mediterranean cuisine remains one of the healthiest in the world. Before you go to Greece, you should check its visa policy and see whether or not you need a visa to cross its borders. Greece is a member of the Schengen Area, which means that the visa you may need is a Schengen visa and not a Greek visa. However, the visa policy of the Schengen Area is pretty lenient. You may not need a Schengen Visa to enter Greece if you are from a country that is a member of the European Union or you are from a country that is in the visa waiver program. The former group of travelers enjoys freedom of movement within the Union, while the citizens of the latter group can stay in the Union for up to 90 days. It is as simple as that. The rest of the nationalities are required to apply for a Schengen visa. 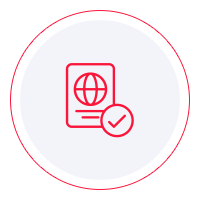 To find out whether or not you need to apply for a visa, you can use iVisa’s Visa Checker. It is a simple tool located in the top right corner of this page. All you must do is choose your nationality from the drag-down menu and put Greece as your destination. If you do not need a visa, that's fine. If you do, you will be given of list of the embassies you can use to apply. iVisa does not process requests for Schengen Visas, but we are still eager to help you however we can. Information is all we can provide at the moment, which is why our support service is at your disposal 24/7 and with no charges. If you find out that you need to apply for a Schengen visa, you must go to the embassy. But which one? What you should know is that it is not necessary for you to apply for a Schengen visa at the embassy of Greece. According to the visa policy, if you go to Greece only, then, of course, you need to visit the nearest Greek embassy. However, if you have multiple destinations, you need to apply for your Schengen visa at the embassy of the country that is your primary destination. If that cannot be determined, you need to submit your application for your visa at the embassy of the country you visit first. So, if you plan to go to Germany and then to Greece, the visa that you get from the German embassy grants you entry in Greece as well. We are sorry that we cannot do more for you at the moment, but we hope that the pieces of information you read above are of some help. If you have any more questions, feel free to contact us.